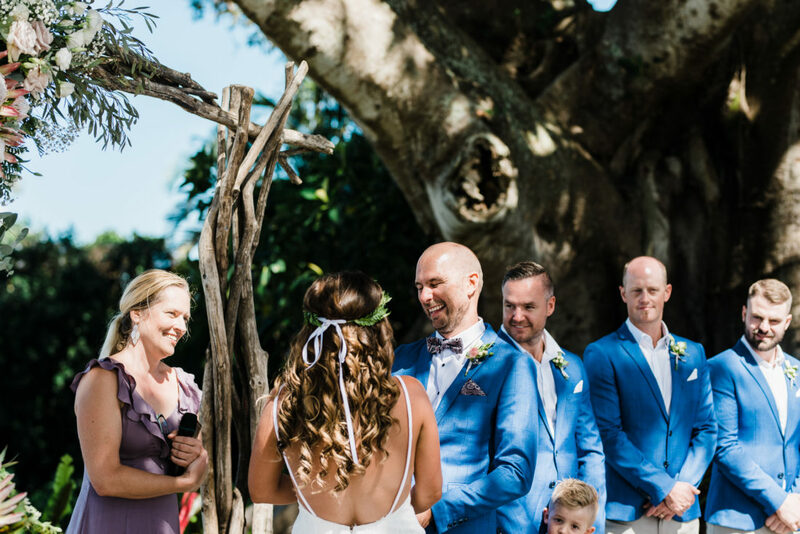 Wedding at Fig Tree, under a magnificent Fig Tree! 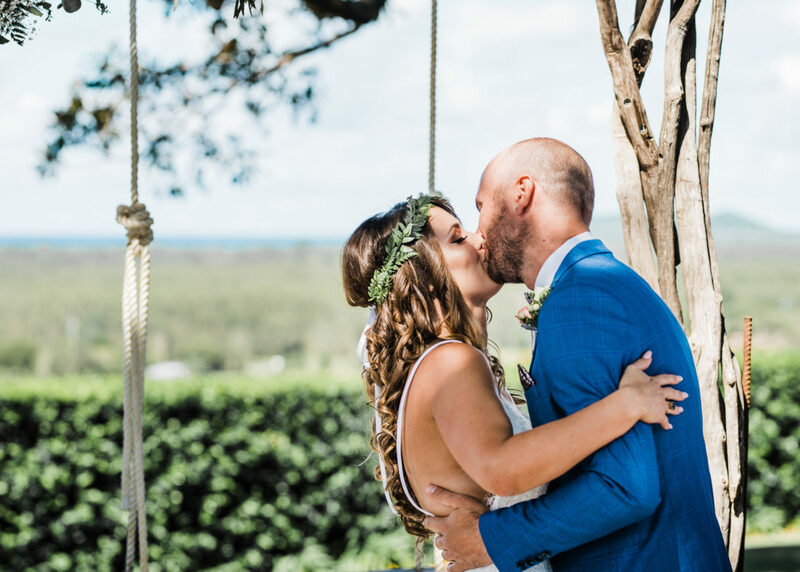 Lesley and Chris, from Newcastle, NSW, had a wedding at Fig Tree, under a magnificent fig tree! Having met when Leslie was on a work trip to Newcastle, they realised they shared a similar sense of humour. They immediately hit it off and spent the day laughing so much that their faces hurt. Certainly a good omen for a relationship! They both couldn’t wait until they met up again, and the rest, as they say, is history. Or should I say, was just the beginning of something very special. 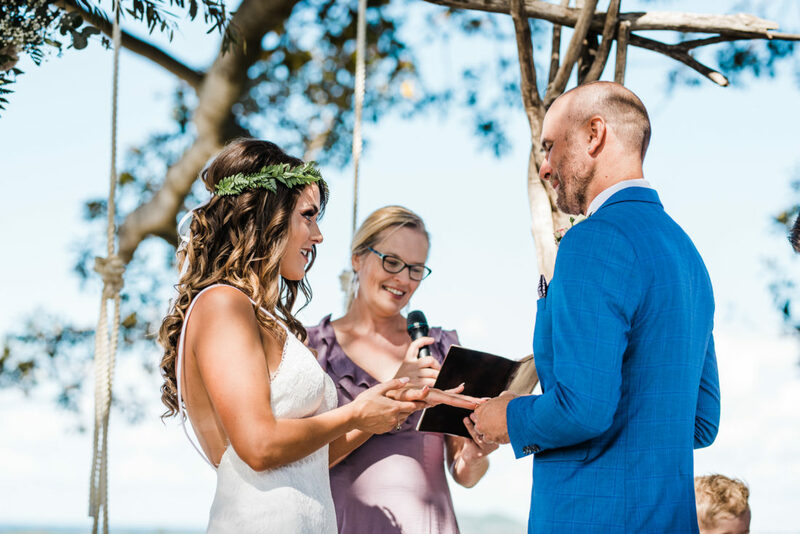 Deciding to get hitched in Byron Bay, they contacted me and I was privileged to be chosen as their Civil Celebrant. 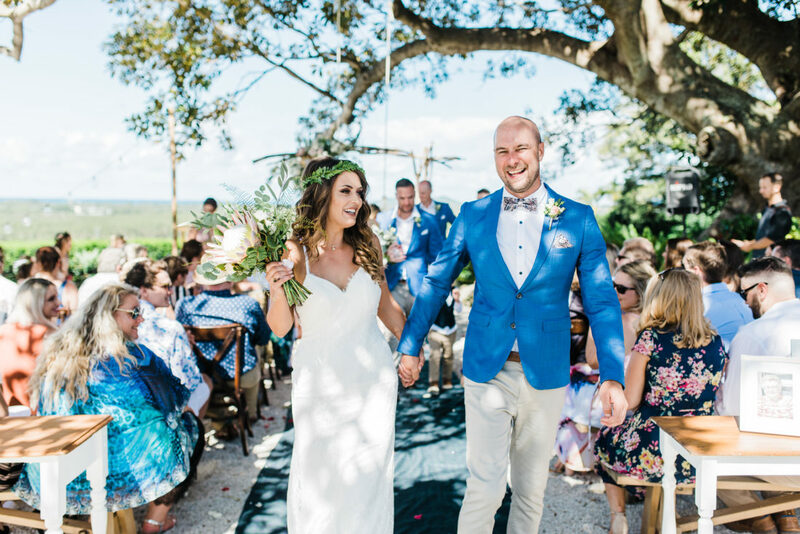 The backdrop for their ceremony was the stunning panorama of Byron Bay. From this venue, one can see all the way out to the ocean, the lighthouse and beyond! What a perfect day with hardly a cloud in the sky! 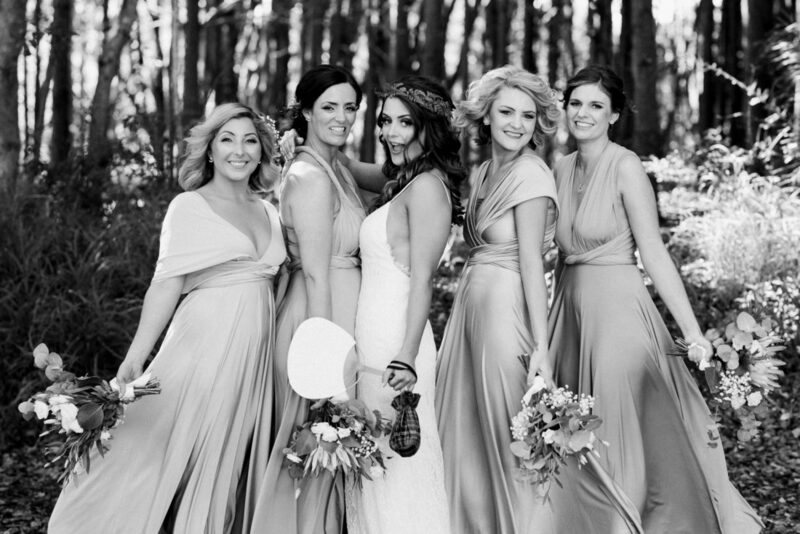 Leslie looked absolutely stunning, as did her bridesmaids- proving that bridesmaids definitely don’t have to wear identical outfits! 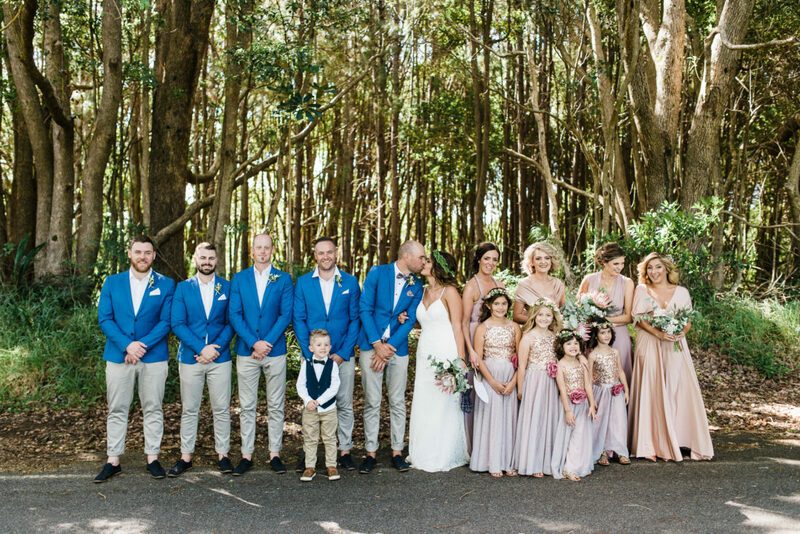 Chris and his groomsmen were in beautiful bright blue jackets, reflecting the blue sky and the blue ocean on the day. 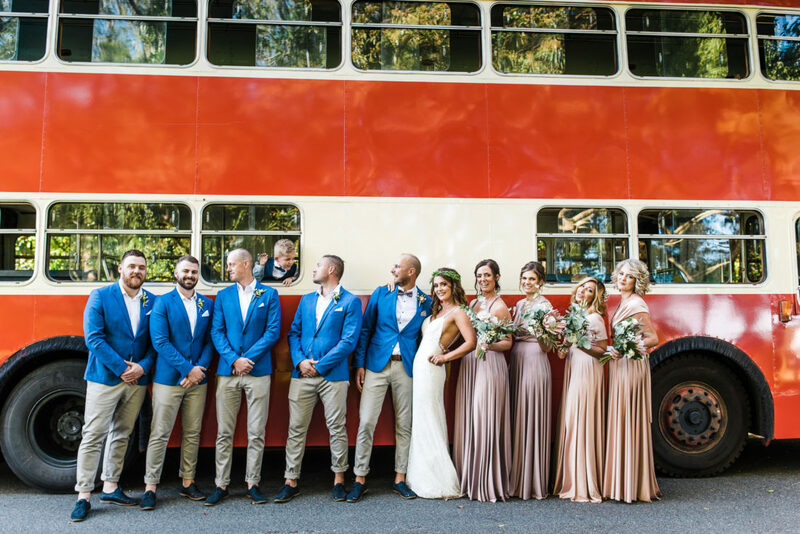 Guests arrived in a double-decker bus. There were smiles, and tears of happiness all around as Lesley walked up the aisle to her soon-to-be husband. A swing hung near the arbour from the fig tree and in one of the photos you can see Chris’ daughter, looking lovely, enjoying a swing- captured by the photographer Steve Doyle. Congratulations, Les and Chris! It was an absolute pleasure to meet you, hear your love story and be able to be a part of such a special moment that you and your guests will remember for the rest of your lives. I wish you all the happiness and good fortune in the world for your journey forward together.